Ten eager entrepreneurs will compete for their share of $30,000 in funding at Wilfrid Laurier University during LaunchPad Lift Off, a pitch competition and venture showcase at Lazaridis Hall on Friday, March 15. The event is being put on by Laurier’s incubator, LaunchPad, which is run by the Schlegel Centre for Entrepreneurship and Social Innovation. The competition and showcase is the culmination of a six-part LaunchPad workshop series that aims to develop entrepreneurs and provide them with a toolkit to help them grow their businesses. Through workshops and mentorship, LaunchPad participants learn how to validate their ideas, fine tune their business model, develop their messaging, and engineer their sales process. “LaunchPad workshops opened my eyes to understanding different parts of my business,” says Jessica Kalman, who founded KLMN Media in 2018 and discovered her passion for entrepreneurship as a student in Laurier’s Entrepreneurial Method course. KLMN Media creates social media marketing content and strategy customized for small and medium-sized businesses. 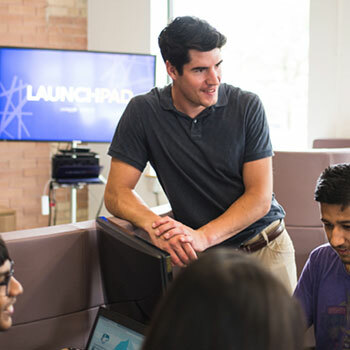 All LaunchPad ventures are founded by a current Laurier student or alumni. Ten of these ventures will be pitching to a panel of judges at Friday’s event. Judges include Bob Schlegel, founder and chief executive officer of Bedrock Freight Logistics and namesake of the Schlegel Centre, Kim Morouney, managing director of the Lazaridis Institute for the Management of Technology Enterprises; and Yvan Couture, chief executive officer of Primal.AI. In 12 short months, LaunchPad companies have generated over $2 million in external funding. Jim Moss, co-founder of Plasticity Labs and a LaunchPad graduate, will join the pitch competition as keynote speaker. The $30,000 in funding is generously provided through Schlegel Centre supporters: TD Bank, BMO Bank of Montreal, and National Bank. LaunchPad is also supported by Laurier’s Lazaridis School of Business and Economics, RBC, Ontario Centres of Excellence, and the Government of Canada. “Funding from the competition would allow me to upgrade my photography and computer equipment, and invest in more strategic marketing for my creative business,” says Kalman. Pitches will begin at 10:30 a.m. on Friday, March 15. Following the pitch competition, all 25 LaunchPad-supported entrepreneurs will showcase their businesses in the Lazaridis Hall Atrium, starting at 2 p.m. The world is constantly changing and people need to change with it. That’s why Laurier directly supports entrepreneurs, not just their idea or technology. The LaunchPad program is open to ventures of all kinds, from for-profit to social enterprises. and low- tech to high-tech companies. “We hope to inspire all students and alumni who are interested in entrepreneurship to learn about it through courses and extracurricular experiences, try it out by creating and testing their ideas in Schlegel Centre workshops and hackathons, and then starting their businesses for real with the support of LaunchPad,” says Allan. Mentorship: LaunchPad companies enjoy access to 35 seasoned mentors, who help the entrepreneurs by challenging them and providing contacts and sound business advice. Dedicated space: entrepreneurs take advantage of working space and resources at the Communitech Data Hub and the Accelerator Centre. Programming: tailored workshops and specialized expert advice (e.g., legal, accounting, etc.). Funding: access to seed funding through a variety of programs. LaunchPad participants leave the program ready for whatever the real world throws their way. LaunchPad is open to every Laurier student and Laurier alumni. 60% of LaunchPad companies are run by current students and 40% are run by alumni. 44% of LaunchPad companies are run by females. 40% of LaunchPad companies have social impact.